'CSR', 'Green', 'Ethics', 'Fair Trade', 'Organic' are all buttons that marketers are keen to push right now to get us to engage us with their products. Why? Because, amongst many, these issues hit a nerve and our consciences can be comforted in the knowledge we are purchasing for the greater good. 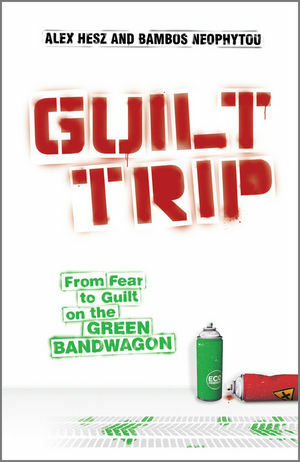 Guilt Trip talks to the history of the marketing communications story, analyses the journey of traditional advertising techniques past and present and tackles the exploitation of guilt and fear. The authors talk with leading marketers and advertising agency heads, politicians and consumers, doctors and historians to explore the pivotal role played by the Green phenomenon within this transformation. Going further, it asks how companies, politicians and individuals will react to this emerging but irrevocable change, and what will be the fate of those who react too slowly, or ignore it altogether. Across several of London’s Advertising and Communications agencies, Alex has worked with some of the world’s largest brands and businesses, including British Airways, GlaxoSmithKline, RBS, Coca-Cola, Nestlé, Diageo, Nokia and the UK Government. In particular, Alex has worked broadly in the areas of sustainability and corporate responsibility, whether reducing the size of cat-food boxes, preventing children from using their phones for bullying or working towards a single, universal charger. He lives in South London, and works at DDB. Since abandoning his academic research program (a hopelessly inadequate attempt to fuse sociolinguistics with cognitive pragmatics), Bambos has worked or consulted for a variety of organisations (Added Value, BBC, BBH, VCCP) in a strategic marketing and communications capacity. Having been unable to finish reading any books on marketing communications, he has always wanted to write one that was readable from beginning to end. He believes this has now been achieved. He currently lives in West Berkshire, is training to be a carpenter and is Head of Planning at Exposure. Introduction – Idiots and Infants. Chapter 1 An Irrational Animal. 1.1 The Sneetches and Other Parables. 1.2 A Rose by Any Other Name. 1.3 ’Tis the Season for Extraordinary Mass Acquisition. Chapter 2 The Necessary Lie. 2.2 A Brief History of Shouting – Part 1. 2.3 A Brief History of Shouting – Part 2. Chapter 3 You Can’t Handle the Truth. 3.1 Keep It Simple, Stupid. 3.3 The Tuna that won’t Turn Pink in the Can. Chapter 4 Guilt is the New Fear. 4.1 The Pet Goat, and Other Frightening Stories. 4.2 Culpability Killed the Cat. 4.3 The Big Green Button. Chapter 5 Shades of Green. 5.1 A Sweet Truth, or, A-Till-a the Un-healthy. 5.2 A Token of Appreciation. 5.3 The Arabian Babbler and Bob Dylan. 6.1 Ask not . . . .
6.2 It’s OK to be Bad.